What is Pina Pool Technique? The turkish standard 13661, collects information and regulation related to public use outdoor swimming pools, therapeutical pool equipments and employees safety. Pina Pool achieved this standard TS 13661, being its contents according to our goals and basic principles, and our working procedures are oriented to this direction. Pina Pool's techniques, with 30 years of experience, hundreds of finished construction projects, thousands of local and overseas equipment sales, tens of thousands satisfied users, strong market position and manufacturing advantajes, are being reinforced by TS 13661. To achieve a healthy and safe water, it is necessary to treat these three stages as a whole thing. Missing any of these steps will turn into impossible our possibility of success. "35 years of experience in swimming pools"
Sand filters are the main element of the pool water treatment systems. The better we filter our pool water, the more successful our proccess will be. 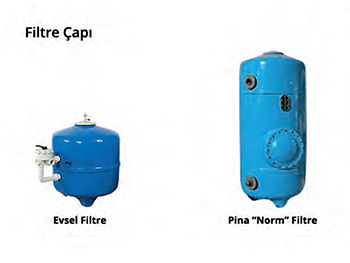 According to the TS 13661 standard, it is mandatory to use industrial type filters (Norm filters) in open swimming pools. 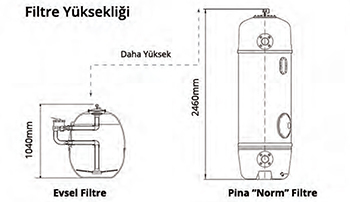 Built with the same diameter like the domestic filters, the Norm filters are about 90-100 cm taller than these, and can hold up to double quantity of sand, resulting a higher sand bed. According to the standard, a height of 120 cm sand is mandatory. This way we will increase the quality of the filtration for our water. 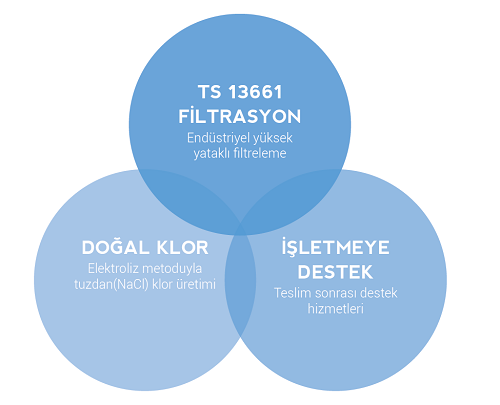 Furthermore, following the TS 1366, the calculation method and filter diameter used for outdoor pools is very different from calculation methods and filter diameters used for domestic pools. Regarding to the results of the Standard calculations, we will have to use bigger filters. At the accumulation stage, the different dangerous ingredientes like iron and aluminium powder, is destabilized by using of a suitable dosing pump. We can't finish a filtering work without this stage. For having a healthy water, we can use either automatic systems which will set up our water to our desired levels of chlorine or PH, either some other systems that requires some human intervention. Pina Pool advises the use of chlorine obtained by salted water electrolysis. 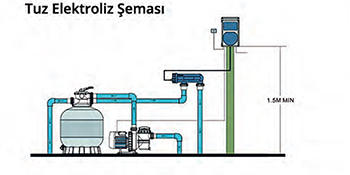 This way, we can reduce the chemical costs and produce chlorine from salt. By using a natural product derivated from salt, "Organic Chlor" you will both reduce your operating costs and care the health of the pool users who you are responsible for. Pina Pool can bring its customers the maintenance service which the standards claim, since we have all the neccesary information and the required knowledge. We are able to urgently treat he problems which can often arise during the operations. In TS 13661 we can check how often should the maintenance checking and operations be done. If we successfully complete and carry on all the services englobed in the Maintenance jobs we will stablish a healthy water supply for the long term.